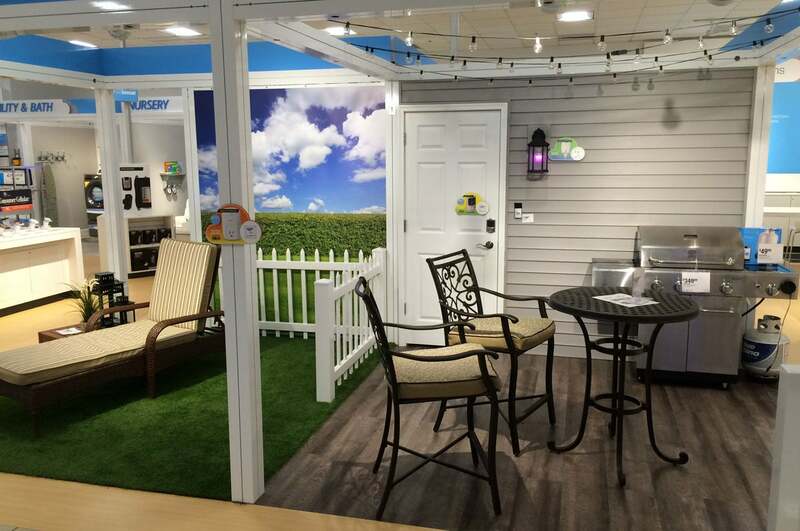 Two retail giants are making the most of their brick-and-mortar assets to help educate consumers about the latest smart-home trends. The connected home isn’t just a dream for consumers, it’s also a bonanza for retailers who stand to cash in big on shoppers looking to upgrade their home life with a few well-chosen gadgets. But connected-home devices are quite a new and emerging market, and confusion is rampant when it comes to products such as smart light bulbs and cloud-connected thermostats. To help shoppers figure it all out, a couple of progressive retailers are carving out “connected showrooms” in their stores. The big idea: People might actually buy this stuff if they get a chance to play with it firsthand, rather than simply looking at pictures of it online. I visited two of these showrooms, both Sears and Target stores in the San Francisco Bay Area, to see what retailers are doing to help the masses understand this market—and whether you should venture out into this brave new world for yourself to get some hands-on time with connected gear. 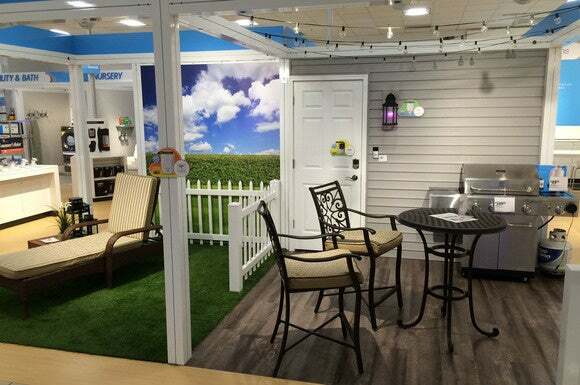 Sears displays its connected-home products in rooms where each device would be typically installed, such as an outdoor deck. You don’t need to put on your Sunday best to visit Sears any more, but you’ll want to bring your walking shoes and thinking cap to this store-within-a-store inside the Sears location anchoring the nondescript Tanforan shopping mall in San Bruno, Calif. It’s easily worth a visit if you find yourself overwhelmed by the growing number of connected-home options on the market. 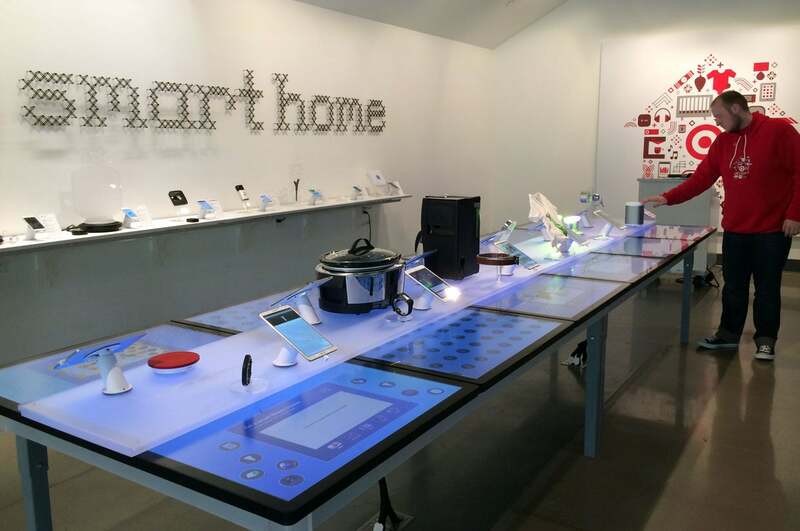 The store, which opened in June, covers a spacious 4000 square feet, and is designed to feel as though you’re walking through an actual smart home. A gabled doorway leads you into the “living room,” where a variety of Philips Hue lights and a smart TV anchor a small room filled with contemporary furniture. Behind the living room, there’s the “kitchen,” complete with smart crock pot and smart coffee maker. You can stroll from there to a nursery room, a couple of workout-centric areas, an outdoor patio, and even a garage. Every room is loaded with gizmos talking to one another, right down to the string of light bulbs zigzagging overhead on the faux deck. Kudos to Sears for pulling out all the stops on these rooms. 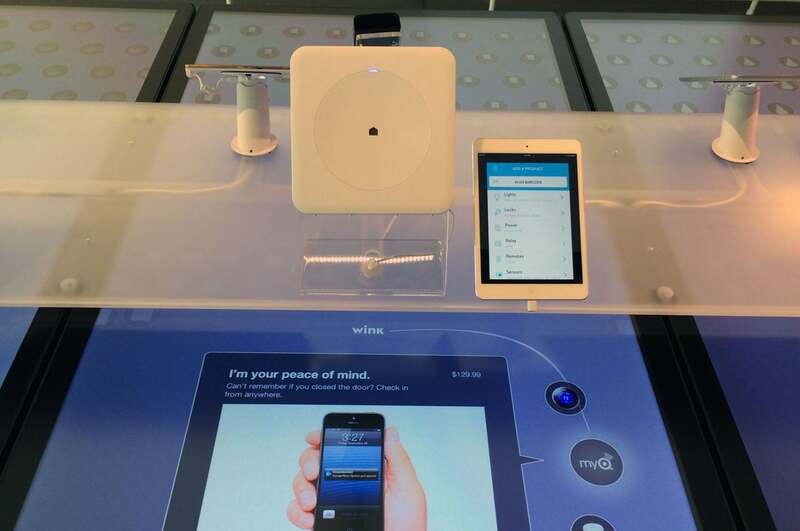 Nothing is faked in the store, and many of the devices can be operated (in limited fashion, at least) through a tablet that’s anchored next to each station. Even the garage door—a smart unit that you can open and close remotely—is up and running. Curious to see what a smart garage door can do? You can see one in action at Sears. The “room” mentality doesn’t work for everything, and sure enough there is plenty of gear in the showroom that doesn’t quite have a home. A massive selection of routers is wedged into cubicle-like setup where the unsexy stuff—ugly, but necessary—gets shunted. Similarly, items like hubs and smart wall switches are stuffed under display tables in what I suppose could be described as the “utility closet” of the virtual smart home. Other items, like a smart irrigation system, just seemed as though they were shelved somewhere at random. All the while, it’s hard to forget you’re in Sears, not something like, say, an Apple Store. Just about everything in the Connected Showroom is for sale, right down to the furniture. In fact, very few shoppers ventured into the space during my time there—most were seemingly drawn to the large wall of televisions just outside the showroom space—and the few who did seemed more interested in the dumber gear than anything else. A couple considered the refrigerator in the Connected Showroom kitchen for quite a while before wandering off, claiming it was too expensive. 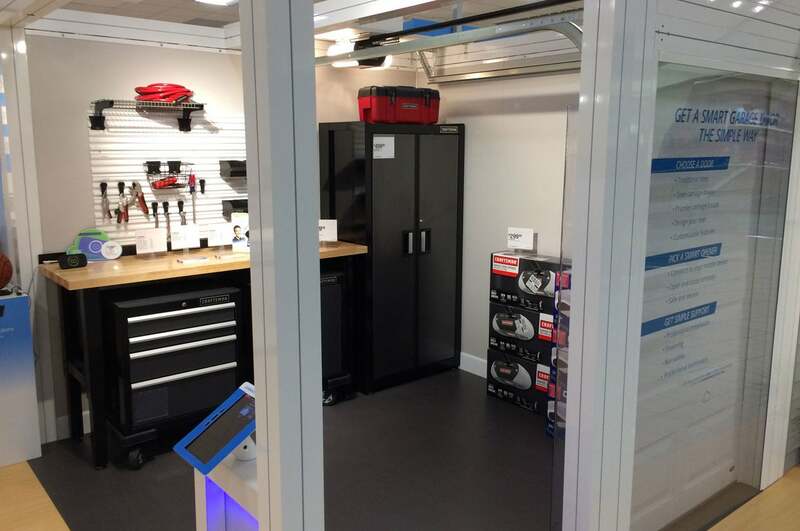 The Connected Showroom has its own dedicated salespeople, and I was attended to quite capably by Lenny, a gregarious young man with a solid understanding of the devices on the floor. The showroom sprawls over an exhaustive amount of space, so even a “quick” tour to see all the devices will take you the better part of an hour. Lenny had a lot of favorites to share, and was able to talk in depth about the pros and cons of various devices. 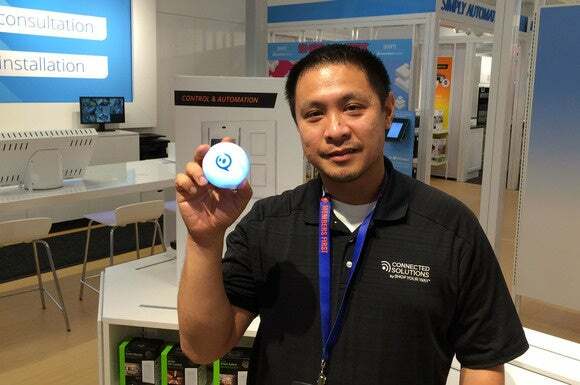 The personnel at both stores were very knowledgeable about the connected-home products on display. One thing that he was careful to elaborate on was the fact that many of the devices on display required additional hardware to work, namely a smart hub that connected to your router. Ultimately I was completely confident that the sales staff would never have let me out the door without everything I needed to get my purchased gear up and running. If you’re not confident in your abilities, Sears does offer installation services, ranging from $120 for installing a smart thermostat to $330 for installing a hub plus 15 items (such as light bulbs and security sensors). Those rates seem a little pricy, as do Sears’ prices in general. I only noticed one item that was on sale, a security camera at $20 off. The name “Connected Showroom” really only describes half of the agenda, as the space is really built as a merchandising center, with boxes and boxes of products stacked on shelves and hanging on displays, all designed to encourage you to pick up the product and take it to the checkout counter. That said, the space is likely to be overwhelming to someone who isn’t at least somewhat familiar with he’s getting into. Just as Sears and Target are radically different stores, so are their approaches to selling connected-home gear. On the day I visited the Target Open House, located in downtown San Francisco in the Metreon center, it had only been open for eight days. You wouldn’t have known it. 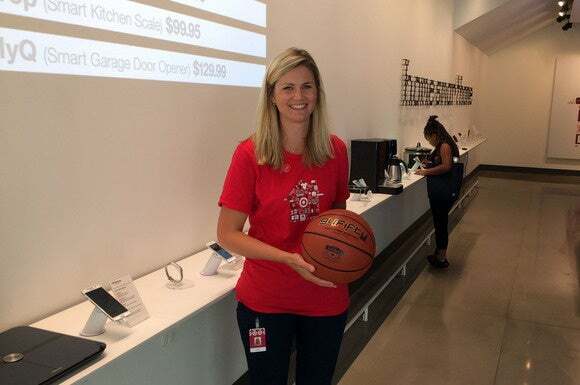 Everything was operating smoothly and efficiently, and the red-shirted sales staff seemed completely confident in discussing the finer points of the various gadgets on display. The Wink Connected Home hub is one of the products available for a demo at the Target Open House. As with Sears, the Target Open House begins with a series of themed rooms. Here, you walk through a front door, where a smart doorbell and door lock are being demonstrated, then pass through a living room, bedroom, nursery, and outdoor area, each with three to five smart devices on display. But that’s where the similarity with Sears ends. While Sears’ rooms are designed for interactivity, the Target rooms are meant to be viewed more passively. Tablets in the center of each room invite you to press a button to initiate a typical usage scenario. In the nursery, tap to see how your smart home might help you out with your infant’s bedtime routine, for example. Or in the bedroom, tap the “Burglar!” button to watch as the system automatically sounds an alarm through your Sonos and flashes your Philips Hue bulbs panic red. These effects are all automated and annotated with text that is beamed directly onto the translucent walls. It’s a bit like a kiddie ride at Disneyland, if the ride ended by turning on a web-connected humidifier. Target's sales people are well versed in the smart-home products they're selling. After you tour through Target’s themed vignettes, you’re directed to a long table and wall display where each of the gadgets you just encountered can be interacted with personally. The tables are all Surface-style touchscreens that provide more information than you could ever want to know about the ins and outs of, say, the pet-activity tracking collar. When you’re done watching videos, a tablet paired with each device is standing at the ready, letting you see exactly how it works. While Sears gives you this capability with some of its merchandise, Target offers the hands-on experience for every single thing it sells. Speaking of going mainstream, did you know you can buy Sonos speakers at Target these days? Kate was my guide through the store, and she was able to talk in considerable detail about the workings of any of the products on sale here. Foot traffic was extremely brisk during my visit, with shoppers seeming to take a real interest in the displays and staff amicably guiding them through what must have been the most unique visit to Target they’d ever experienced. It’s curious then that Target’s top-selling items—displayed in real time and projected onto a wall—aren’t the expected security cameras and light bulbs but rather the Tile key-finding system, which really isn’t a connected-home product at all. The number-two seller is a smart pet food dispenser. Target Open House is a fun little laboratory, but it feels more like an experiment than the broader retail experience at Sears. But that may be exactly what this often confusing industry needs right now: At neither store did I witness anyone actually buy anything.